Located in the heart of Beacon Hill, adjacent to the State House, and minutes from downtown Boston, XV Beacon Hotel offers unique private dining options and meeting spaces for various events, corporate or social, large or small. Its signature restaurant, Mooo…., exudes modern elegance while maintaining traditional sophistication with its outstanding menu and renowned wine list provides menus for onsite events. The Wine Cellar, the historic private dining room, boasts a renovated Italian Mosaic from A.D. 500, double vaulted ceilings, stone floors, and walls lined with an exclusive collection of rare and fine wines. 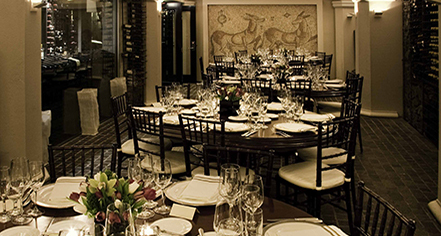 The cellar comfortably accommodates 26 guests conference style, 36 for a seated dinner, or up to 75 for a reception. Parlor Suites features a grand mahogany table that seats up to 14 guests. Dining options are provided by Mooo…. with a variety of breakfast, lunch, dinner, and break menus. Audiovisual requirements are provided upon request. 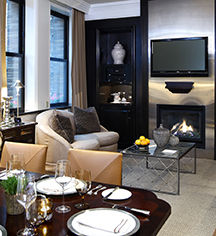 The Parlor Suites’ refined elegance is perfect for any private event or meeting. The Roof Deck’s intimate 2-tier outdoor setting can host receptions on both tiers for 70 guests or ceremonies for 50 guests. The space is the hidden gem of Beacon Hill with unrestricted views from the 11th and 12th floors of the hotel overlooking Boston’s skyline. XV Beacon can assist with custom floral arrangements and custom menu design and printing. The Wine Cellar, Parlor Suites, and Roof Deck have all audiovisual capabilities and boasts unobtrusive service.